So. I just moved into a new house a few weeks ago. Because this is the first abode I've genuinely felt excited about inhabiting, I'm brimming with ideas to make it "my own." Maxwell Ryan and Janel Laban's Apartment Therapy: Complete + Happy Home with its 300 pages of full color photos brought me into the dwellings of well-to-do homeowners and renters, city and country folk. While I enjoyed gawking at all the photos and imagining the designers, artists, professors and CEOs that actually lived in the locations featured, I didn't feel there were too many ideas that applied to my tidy, 1940s brick cape cod. Most of the rooms featured - especially living rooms and bathrooms- were truly oversize. Even the supposed "entry-level" apartment has an open, airy feeling afforded by gigantic windows. Huge floor to ceiling windows that bathe a home in light go a long way toward good design, so I've been opening my window treatments wide each morning to enjoy a natural mood-lifter. Turn what might be clutter museum-like display using focal points. Play up favorite pieces of furniture as well. As the authors put it, "Every room should have a 'moment,' big or small, that is eye-catching and special." So, in short, this book made me feel both optimistic about making my house a home, and a little envious of those with a much larger budget. 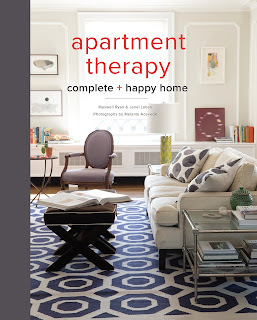 The title, which takes its name after the authors' popular website, is misleading for those who think apartment = furnishing and designing on the cheap.